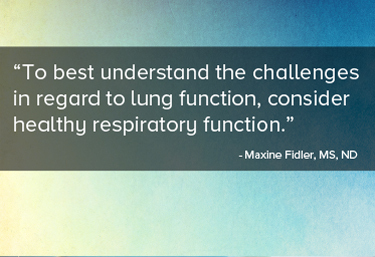 To best understand the challenges in regard to lung function, consider healthy respiratory function. Anatomically speaking, upper respiratory passages consist of nasal passages and sinus cavities. Lower respiratory passages begin with the trachea, branch into two main bronchi, which then further branch into bronchioles, ending in alveoli. Alveoli are the sites of gas exchange, where oxygen is absorbed into the bloodstream from inhalation, and carbon dioxide is released for disposal by exhalation. There are several protective mechanisms. The nose contains hair, to help filter out dust and particulate matter. The respiratory tract is lined with mucus-producing goblet cells and tiny cilia, together known as the mucociliary escalator. The goblet cells produce mucus that rests on the cilia, which move rhythmically to propel the mucus (and any dust or microbes trapped within it) up toward the throat, to be swallowed or spit out.1 The bronchi also warm and humidify air. Understanding how environmental factors influence lung function, will help you take steps to compensate. Consider developing a plan of action with patients as the weather gets colder to address the specific challenges that can arise. Developing the plan together can also help to improve the patient’s adherence. Maxine Fidler is a freelance medical writer in Middlebury, VT. She obtained her doctor of Naturopathic Medicine, and master of Acupuncture and Oriental Medicine degrees from from Bastyr University in Kenmore, WA. In addition to writing, she is an adjunct professor at Community College of Vermont, teaching courses in life science and allied health. After several years in private practice, she now teaches and writes full-time. Rhoades R, Pflanzer R. Human Physiology. 4th ed. Pacific Grove, CA: BrookCole; 2003. Fares A. Factors influencing the seasonal patterns of infectious diseases. International Journal Of Preventive Medicine [serial online]. February 2013;4(2):128-132. Available from: MEDLINE, Ipswich, MA. Accessed November 13, 2016. Kenefick RW, Hazzard MP, Mahood NV, Castellani JW. Thirst sensations and AVP responses at rest and during exercise-cold exposure. Medicine and Science in Sports and Exercise. 2004;36:1528–1534. doi:10.1249/01.mss.0000139901.63911.75. Halloran S, Wexler A, Ristenpart W. A Comprehensive Breath Plume Model for Disease Transmission via Expiratory Aerosols. Plos ONE [serial online]. May 2012;7(5):1. Available from: Publisher Provided Full Text Searching File, Ipswich, MA. Accessed November 13, 2016. Nicola M, Carvalho H, Nakagawa N, et al. Young 'healthy' smokers have functional and inflammatory changes in the nasal and the lower airways. Chest [serial online]. May 2014;145(5):998-1005. Available from: CINAHL with Full Text, Ipswich, MA. Accessed November 13, 2016. Kasahara A, Singh R, Noymer A. Vitamin D (25OHD) Serum Seasonality in the United States. Plos ONE [serial online]. June 2013;8(6):1. Available from: Publisher Provided Full Text Searching File, Ipswich, MA. Accessed November 13, 2016.